Compiled by Susan L. Harnwell and other avid readers. See the Consolidated Lists of primary source documents and list of available photos at this site. Ford, Andrew E., "The Story of the Fifteenth Regiment Massachusetts Volunteer Infantry in the Civil War 1861-1864," W. J. Coulter Press, 1898, online at archive.org. Edwin R. Root and Jeffrey D. Stocker, "Isn't This Glorious: The 15th, 19th, and 20th Massachusetts Volunteer Infantry Regiments at Gettysburg’s Copse of Trees", Moon Trail Books, Hardcover, 237 pages, December 2005. It can be ordered by calling the publisher at 610-866-6482. Coco, Gregory A., editor, "From Ball's Bluff to Gettysburg...and Beyond: The Civil War Letters of Private Roland E. Bowen, 15th Massachusetts Infantry 1861-1864," Thomas Publications, P. O. Box 3031 Gettysburg, PA 17325, 1994. Comment from Will Melton: Daniels' book has extensive material on the regiment's formation and service including a list of members of Co. E, their age at the beginning of service, their occupations, rank, dates of enlistment and discharge, and residence as of 1890, if known. It also includes the roster of members of the regiment from Oxford who died in service. Holien, Kim Bernard, "Battle at Ball's Bluff", Moss Publications (July 1996). Catton, Bruce, "This Hallowed Ground"
Sears, Stephen W., "To the Gates of Richmond: The Peninsula Campaign", Ticknor & Fields, 1992. Comment: EXCELLENT! The order of battle is listed in the back of the book down to regimental and battery level. Sears, Stephen W., "Landscape Turned Red: The Battle of Antietam," Houghton Mifflin, 1982. Frassanito, William A., "Antietam: The Photographic Legacy of America's Bloodiest Day," Charles Scribner's Sons, New York, 1978. 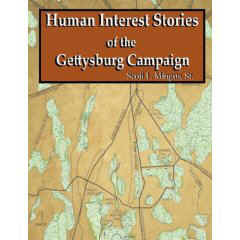 Mingus, Scott L. L., Sr., "Human Interest Stories of the Gettysburg Campaign, " Ortanna, PA: Colecraft, 2007, contains an anecdote about Thomas J. Spurr of the 15th Massachusetts. Bailey, Ronald H., "The Bloodiest Day-The Battle of Antietam", Time-Life books, p. 90, with the story of the 15th MVI being hit by friendly fire. Sears, Stephen W., "Chancellorsville," Haughton Mifflin Company, Boston, New York 1996. Note: the 15th was only marginally involved here. Edwin R. Root and Jeffrey D. Stocker, "Isn't This Glorious: The 15th, 19th, and 20th Massachusetts Volunteer Infantry Regiments at Gettysburg’s Copse of Trees", Moon Trail Books, Hardcover, 237 pages, December 2005 It can also be ordered by calling the publisher at 610-866-6482. "Gettysburg" (the film), starring Tom Berenger, Jeff Daniels and Martin Sheen, from Turner Home Entertainment. This one is not exactly about 15th MVI, but until we have a specific history it will provide an idea about what went on at Gettysburg. I think it's a terrific film. Scott, Robert Garth, "Into the Wilderness with the Army of the Potomac", Indiana University Press, 1992. Comment from Phil Richardson: "Scott's attention to detail down to the regimental level is similar to Sears, and he also includes an order of battle. Very enjoyable reading." "Massachusetts Soldiers, Sailors, and Marines in the Civil War", Compiled and published by The Adjutant General in accordance with Chapter 475, Acts of 1899 and Chapter 64, Resolves of 1930, Vol. VII, Norwood Press, Printed at the Norwood Press, 1931. I can't recommend this one enough. It's an enthralling introduction for those with no knowledge of the American Civil War, and it's filled with plenty of compelling human detail to hold the interest of those who do. An absolute must for anyone with an interest in American history. Walker, Francis A., "The History of the Second Army Corps in the Army of the Potomac," C. Scribner's Sons, 1887. (Online at archive.org) Bob Ducharme says, " I found some interesting facts not found in Ford's book, and it includes a very good description of the marches during the Bristoe Station campaign." See also the Bibliography on the 15th MVI compiled by the U. S. Army Military History Institute in Carlisle, PA. When you reach the Civil War page, you will need to manover through "Browse" > inf > ma > 15th. The American Antiquarian Society in Worcester, MA. Use their Gopher Site to search for family papers. So far, I have found collections for Chaplain Wm. Scandlin, J. M. Studley, F. J. F. Crossman, S. F. Haven, and Clara Barton. There may be more from the 15th.